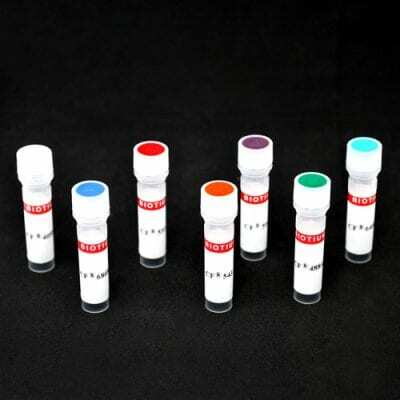 This product is prepared by labeling highly cross-adsorbed donkey anti-rabbit IgG (H+L) with our bright and photostable CF® dyes. To minimize cross-reactivity, the antibody has been adsorbed againstÂ bovine, chicken, goat, guinea pig, Syrian hamster, horse, human, mouse, rat, and sheep serum. It’s available with the following CF® dyes and labels: CF®350, CF®405S, CF®430, CF®488A, CF®543, CF®555, CF®568, CF®594, CF®633, CF®640R, CF®647, CF®660R, CF®680, CF®680R, CF®750, CF®770, CF®790, CF®800, Alkaline Phosphatase, Biotin, and HRP.